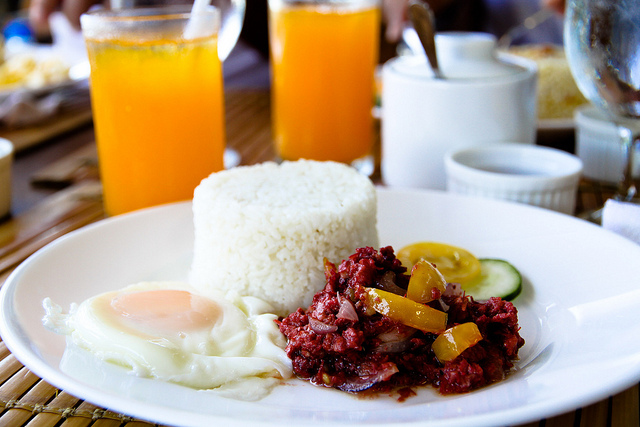 Here is a simple and very basic Filipino style corned beef with potato. This dish is perfect for breakfast. It can be serve with bread also good partner with fried or steamed rice. 1). Fry the potato then separate. 2). Saute garlic, onion and tomato. 3). Add the corned beef and pinch of black pepper. 4). When the mixture is almost cooked add the potato and a cup of water. Wait until it simmers and fully cooked. Mix it from time to time to avoid burning or sticking in the pan or pot. Best served with bread, fried or steamed rice. Enjoy. Corned beed is actually one of my favorite breakfast dish and just like this. Oh, I miss it already. I can't find corned beef in my place, not even in Asian groceries.